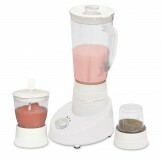 Say goodbye to all your kitchen and cooking woes with the 3 in 1 Multi-function Blender by Cambridge! With the BL-224, one can easily blend, mix, crumb, liquefy and grind necessities in a quick and effective way. With overheat protection, the blender has been equipped to make sure that all mishaps can be avoided.